Initial setup of League Golfer Web (LGW) will consist of five easy steps and takes only about 10 to 15 minutes to complete. We've done the hard work for you and your league will then be created with the most common settings such as points, tiebreakers, handicap calculations, ghosts/absences, etc. and be ready to use immediately! Upon completion of the five basic steps, you'll also be granted access to the advanced settings area to change all settings. You define the number of rounds used, the number of low/high rounds to drop, the percent multiplier, and Equitable Stroke Control (ESC) and everyone's handicap will be automatically updated as you play. Those handicaps will automatically carry over to the printed scorecards, match calculations, and after handicap skins game. Save time and improve accuracy without doing a thing. Making a league schedule is a chore with other league management software. It's literally one click away on LGW. Random schedules, pairings, rain outs, and event date adjustments are automated. Even position events are a single check box and LGW automatically pairs number 1 versus 2, and so on. Finally, if you still don't like the pairings, you can change the matchups immediately prior to entering the scores without having to revisit the schedule. Using our easy to use, quick type scorecard you can quickly enter scores for your entire league. Once scores are entered, select which members participated in after handicap skins, click save and you're done. 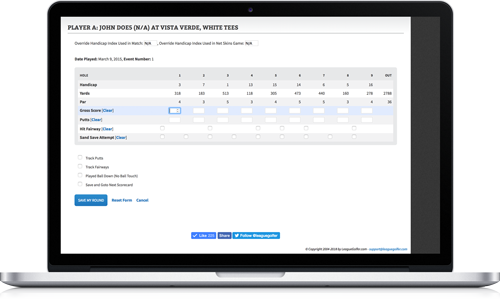 The software automatically calculates how many strokes to give per matchup from the hardest handicap hole on down and creates the reports for you. It saves you time and eliminates human error. Put that paper, pencil, and spreadsheet away forever. Are you ready to measure yourself against other golfers in your league? In your city? State? LGW records a long list of statistics that you can view over time and courses. From Handicaps to Birdie Putt Conversions, you'll be able to see how your game improves (or where it needs improvement) throughout your golf career. 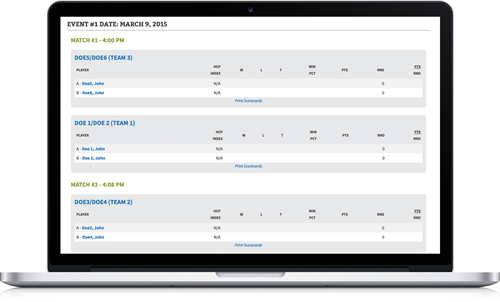 League Golfer Web has customization options for almost all points systems (by hole, by strokes, by holes won, by individual, by team), handicap establishment and ongoing rules, scheduling, adjusted gross calculations, ghost or absent players/teams, 9 or 18 hole leagues, and changing course leagues. We've also made migrating your league while keeping your existing handicaps as easy as possible. Fortunately, you only have to do the league configuration once and it will remember it for subsequent seasons. Simply enter the price per regular team, the number of installments allowed, and the amount each sub pays per round and LGW does the rest. Regardless if it's a two, three, or four person regular team, it automatically enters the appropriate ledger amount per each league member. As you enter rounds for subs, it knows that member is a sub and will add the appropriate ledger amount for each sub round played. After you enter each event's scores, simply check the members who paid and hit save. 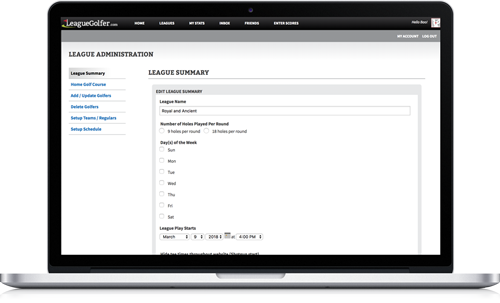 Your league can also view to the running ledger to know if they still owe and how much is available for your banquet. Beyond hanging out with friends, leagues are good for handicaps that allow the playing field to be leveled regardless of golf skill level. Just like in league match play, the better golfers must give strokes to the higher handicapped golfers. After you enter your event's score, simply enter the buy in amount, the type of skins played (ties carry over or ties do not carry over), check the golfers who played in skins, and click save. A skins report is generated for that event normalizing each golfer's hole score after his handicap for the hole with YTD stats on events played, skins won, money won, and net money won. The lower handicapped golfers get all the glory and awards. Again, with handicaps, the league can have a level playing field. The Season Stats report shows the typical current handicap, minimum handicap, minimum gross score, min net (after handicap) score, eagles, birdies, pars, bogeys, and doubles and shows the atypical net double eagles, net eagles, net birdies, net pars, net bogeys, and net double bogeys. Not only will it spark conversation within the league, but also create end of year award categories. These statistics are automatically calculated after each event. Print out the automated scorecards with matchups, tee times, handicaps, and strokes given per match prior to coming to the course. Know who your opponents are and how they've done this season. View team statistics including low team gross, low team (after handicap) net, point totals, sub point totals, etc. from every team in the league. Quickly contact any one in your league either by phone or email. Additional stats show who's active and not active in your league. Why fumble between two or even three sites or even worse, a Windows program on your league manager's computer? At LeagueGolfer.com, scores entered into your leagues are automatically added to personal profile. You do not need to reenter any data. Security is in place to not allow you to change any league round scores, but you can add putts, fairways, and sand saves (if your league manager doesn't do it for you). 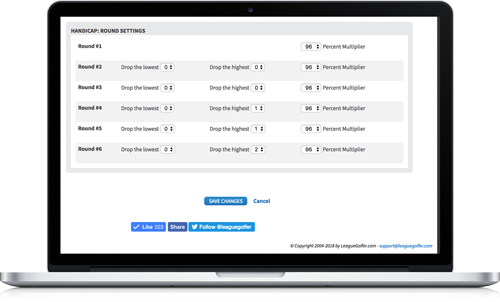 Simply enter rounds you play outside your league to get a comprehensive view of your golf career, stats, and skills. Your golf league handicap is calculated and kept separate from your LeagueGolfer.com differential handicap. While your LeagueGolfer.com differential handicap is a USGA equivalent, we unfortunately cannot claim it to be an official USGA handicap at this time. Please help us grow by inviting your friends, family, and leagues to LeagueGolfer.com and as soon as we can, we'll get the official blessing of the USGA. If you still have questions, visit our FAQ. If you're still not convinced, please click here to test out our demo site. You'll see live data and how easy to use LeagueGolfer.com really is.